“I’m not a baby, I’m a tumor!” chirps an unusually chatty growth in Hellboy II: The Golden Army. As it happens, this creature is, indeed, conjoined with its toothy monster of a mom, obviously the recessive carrier of the good genes. That’s the kind of gag that dominates the work of Mexico’s Guillermo del Toro, a playful filmmaker who seems to have stumbled at an early age into Star Wars’ space cantina and never left. 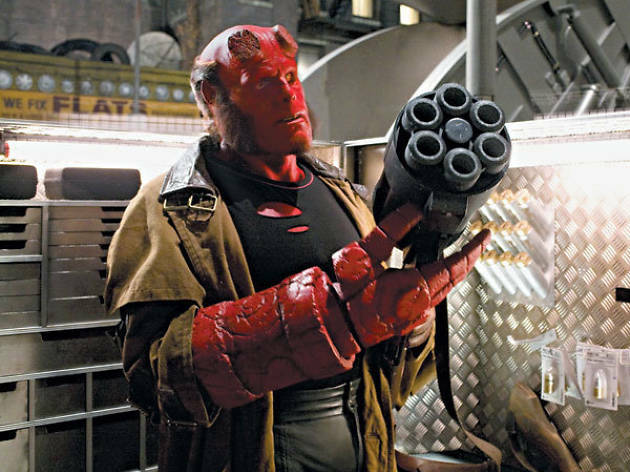 In between 2004’s Hellboy and this sequel, the director won lots of praise for Pan’s Labyrinth, but he’s still a baby-tumor kind of guy. The new movie, continuing the adventures of Mike Mignola’s cigar-chomping demon turned protector (from the Dark Horse comic series), runs heavy on showy effects: all the goo that Del Toro’s Oscar prestige can buy. And yet, Ron Perlman’s growly, Johnny Lunchpail characterization of the antihero—the spawn of Nazi experiments—remains redeeming. Even though we’re underground chasing some albino dude with a sword, the prevailing attitude is less Tolkienesque than Men in Black casual. There’s even a drunken sing-along to a Barry Manilow tune. 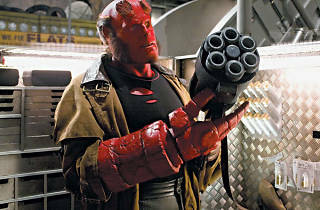 Ultimately—and this is to Del Toro’s credit—he wants to make a film about the struggle to heed our better angels: Perlman’s Hellboy is constantly reminded of his inborn potential for destruction, yet he’d rather lean into his role as a future father with fellow freak Liz (Blair), a pyrokinetic brooder. Maybe they’ll have a baby tumor together. Del Toro is still maturing into the adult who can make that film.